Go to the upper Menu in the Joomla backend. There choose "Extensions/Extension Manager". In the field area "Upload Package File" click on "Choose File" and choose from your Computer HDD the ZIP file. After you have chosen the file click "Upload & Install". When finishing the installation the following screen will appear. If updating, an overwrite templates button will appear. You can configure your component by setting the proper options, like main Image required (yes/no), currencies, time display, time format, and more, all in the Control Panel. After installing the component, in "Settings" you will find the Reverse Control Panel. This is where all the component settings are found, along with some quick info. 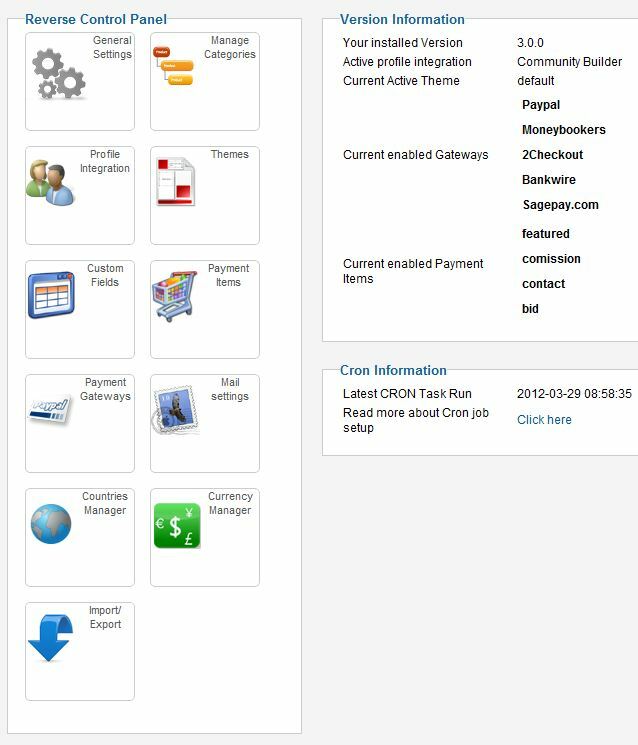 The general settings area is the main area of the control panel, it holds more subsections with listing, workflow, image settings and so on. 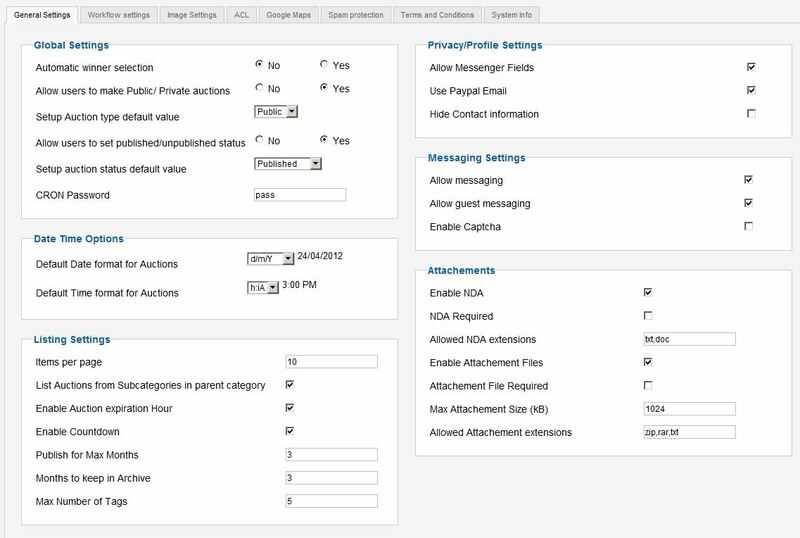 When automatic winner selection is enabled, the Cron task will automatically choose a bidder with the lowest bid as winner when the auction timer expires. Private auctions have the bidding list hidden from other users, showing only the maximum price (starting price). When a large number of categories are present, the drop down box for category selection can become cumbersome. To solve this, webmasters can opt for the category selection page. The category selection will be done before the full auction form is loaded. Besides ACL, auction posting can also be actively moderated. 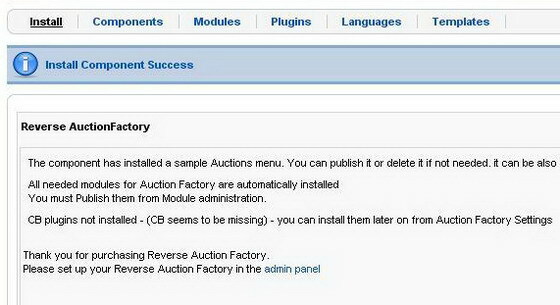 By enabling Admin Approved Listing, all auctions will need to be manually approved by an admin before they publish. On each auction the auctioneer can attach an NDA which can be enabled/disabled as a general settings, allowed file extensions, etc.